Hello everyone! I’ve been posting creative work on a new site! If you want to keep up with new updates, the quickest way is over on my Patreon at The Five Wits Press! There’s an excerpt on Patreon from the restart of The Levour Spectacle, as well as teas and updates on other stories I’m working on. In addition, the first Blackfeather book is now serialized on The Five Wits Press and its Wattpad account, as well as here! The Blackfeather Tea from the last Kickstarter is now available for purchase, in case you missed out on it or ran out of tea from the Kickstarter. I’ve got a lot of plans upcoming about this website, so keep an eye open for exciting changes soon! Update: We made it!! Thank you, everyone! Thank you to everyone who visited me and the books at Anime Central! If you’re visiting from there, welcome! I wanted to announce to those who weren’t at the convention that we’re going to have a Kickstarter to get The Tembelaka Voyage in print, launching on May 26! (That’s this Thursday.) This just so happens to fall on the first day of Balticon, at which I’m a guest! See us there to hear more about the upcoming projects! We’ll post more info here, too. Hey everyone! Sorry for the long hiatus. 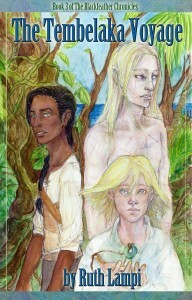 I’ve been posting links to the Blackfeather Chronicles, chapter by chapter, on my tumblr. If you found the stories from there, welcome! I wanted to let you all know I got invited as a guest to Balticon 50! I hope to have a table in the artist’s alley there, too, where I’ll have my prints and the first two books available in paperback, and maybe a bit of something extra! I’ll keep you updated as I get more news about Balticon. I’ve also got a revived art and portfolio website at Worlds Within. The Tembelaka Voyage has been edited and the final version is now available to read here on the website! We’re at GenCon right now and we hope to see you there! We’re at booth #1543 with the books and our wigs. Jess and I have been working on revisions for The Tembalaka Voyage. Right now it looks like The Tembelaka Voyage will be out as an ebook, premiering at Gen Con this august, and hopefully in print a month or two after. We’re looking at a potential Kickstarter that will include printed copies of The Tembelaka Voyage, The Cambriol Riddle, and A Shandorian Journey. More on that as it gets closer. The Levour Spectacle, as you’ve noticed, has been on an epic hiatus while I retool my whole plot outline. I think this one will be best written in full before posting. Thank you all for your patience and support. Thank you to everyone who visited at Balticon, and everyone who’s stuck with me this long! You can also check on Shandor’s tumblr or my twitter for updates as they happen. So, I did not at all account for not having a buffer during convention season. Which was really thick headed of me. I am still alive and writing, though the first at too fast a pace and the second at too slow of one. That said, thank you to the new readers from Tokyo in Tulsa! I will be at Otakon next weekend, with books and prints, and GenCon the weekend after. After that ( and a good lie down) I will be back and trying hard to get you the new chapters you’ve been waiting on.